This is a new house a short distance from my place that I marvel at every time I go by, for any number of reasons. You can see the shape of the previous building that was on the site by the roofline-marks left on the walls of the adjacent buildings. It's not uncommon for buildings to attach that way, which I can't understand because if I had a building, I couldn't imagine liking someone attaching to it. In looking at the parking lot in front of the house, I can make a guess as to what's going on (but it's only a guess): the land owner might have been limited by zoning in how much of the land could be covered by a building, and so rather than waste the uncovered space with a useless garden or an ugly tree, he turned it into a pay-by-the-hour parking lot (that can hold three whole cars!) to try to offset his fantastically huge mortgage. That's my guess, but I'm not wholly confident in it because it's a major business area, so I'd expect zoning to allow 100% building coverage (as the buildings on either side are doing). So, it may well be that the limitation the land-owner faced was in the finances to build a bigger house, and so faced with a smaller house, he decided to put the rest of the land to financially-productive use. Or, it could have been.... well, this is Japan, so probably anything. When I took this photo, the parking lot stuff had just been installed and wasn't yet working, which is why the spots are coned off. These kind of short-term parking lots are extremely common. I've seen them as small as two spots, and as large as 20 or 30. They're generally called “100-yen parking” because prices are usually quoted in how many minutes 100 yen will get you. 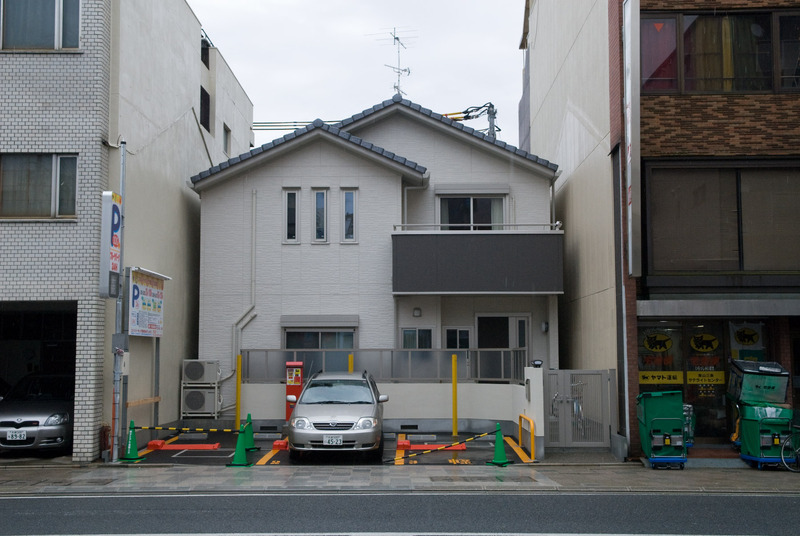 The spots in this picture will go for 100 yen per 20 minutes (a rate of US$2.60/hour) during the day, and 100 yen/hour during the night. The spots have sensors, and a minute or two after a car pulls in, a big plate moves up to block the tires from leaving until the spot is paid for. The ones here are orange. Another interesting tidbit is that because the path from the road to the front door of the house takes away a tiny corner of the parking lot, the rightmost space had to be shortened, and is marked “compact.” The price is the same, though. FWIW, this kind of setup (the plan – not the parking meters/rent/revenue stream) with parking and a tiny entrance into the home is fairly common in Bangalore. 2. Couldn’t one of these parking spots be filled with vending machines that retract into the asphalt when the other two spots fill up? 3.Isn’t that parking lot big enough for a pet grooming salon? 5. Marital dispute over workshop/vegetable garden has surprise ending when flipped coin stands on its edge.